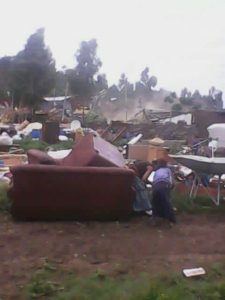 (ESAT News) Reports reaching from Addis Ababa say thousands of households in the capital receive eviction notices. At least 5,600 households in Furi subdivision of the capital received the notice on Monday to pack and leave by the coming Monday while a total of 1,516 residents in Kirkos subdivision were given three days to leave. A mother of three who spoke to ESAT on the phone said she and her children have nowhere to go. Asked if authorities have provided alternative housing, she said there was none. “Only over our dead bodies can the powers that be remove us from our homes,” another resident said. Residents in both subdivisions said they were not provided with alternative housing nor compensations. Thousands of residents in the capital were evicted to give way to what authorities say development projects meant to change the image of the capital. A confrontation during a demolition in the Bole subdivision last year resulted in the death of five police officers and several residents sustained injuries. (ESAT News) A former member of the Ethiopian parliament representing the Somali region says over 20 people have died in just two weeks in one district alone due to a mysterious epidemic, on top of the cholera and worsening effects of drought. Jamal Khalif told ESAT that 90% of the cattle have died due to the severe drought in the region. He warns that if there is no rain in the next 10 days, the situation in Somali region would turn into a serious humanitarian crises. 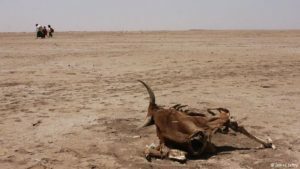 The UN and aid agencies have been warning that the drought in the region is just one stage away from a full blown famine. The Ethiopian regime says some 40,000 cattle have perished in the region. Khalif says he thinks the epidemic is due to the fact that the dead cattle have not been buried properly. He said the areas severely affected by the scourge are Degehabour (Cherer), Wardier (Dollo), Kabridahar (Kurale), and Afder. He also accused that the Ethiopian regime is using food aid as a political tool and that military camps in the region have been turned into prisons where dissidents are being tortured. ህይወት እንደቀልድ የሚቀጠፍባት ፣ ይሄም ኑሮ ተብሎ ክዚችም ላይ እድሜ ልክ ጣር ፣ ሰቆቃ፣ ለቅሶና ዋይታ…. አቅመ ቢስነት ሰለቸኝ!!! ሁልጊዜ ዋይታ ሁልጊዜ ጩኸት ሁልጊዜ ወደ ውስጥ ማልቀስ!!! በአዲስ አበባ በተለምዶ ቆሼ በሚባል ሰፈር የደረሰውን አሰቃቂ አደጋ በተመለከተ በብዙ ኢትዮጵያውያንና የትግል አጋሮቼ ብዙ ሲባል እኔ የተዘበራረቀ ስሜት ላይ ሆኜ ምንም ማለት አልቻልኩም፡፡አደጋውን ስሰማ አቅመ ቢስነትና የበታችነት ስሜት ተሰማኝ፡፡ በሁለት ዓመታት ውስጥ ኢትዮጵያውያን ከሰው በታች ተቆጥረው በሳውዲ አረቢያ ሲታረዱ ፣በደቡብ አፍሪካ ሲታረዱ፣በሊቢያ ሲታረዱ፣በጋምቤላ ሲታረዱና ታፍነው ሲወሰዱ፣በሀገራቸው የፀጥታ ሃይል በኮንሶ፣በኦሮሚያ በአማራ ክልሎች በአሰቃቂ ሁኔታ ሲገደሉ፣ባህላቸውን ለማክበር ኤሬቻ ላይ የተገኙ ዜጎቻችን በአሰቃቂ ሁኔታ ህይወታቸውን ሲያጡ፣ በቂልንጦ ማረምያ ቤት ዜጎች በቁማቸው ሲቃጠሉ ዛሬ ደግሞ የቆሻሻ ክምር ተንዶባቸው ለመስማት በሚከብድ ሁኔታ ህይወታቸውን ሲያጡ ያደረግነው ነግር ቢኖር ለቤተሰቦቻቸው መፅናናትን ይስጥልን የሚል ሀረግ በፌስ ቡክ ገፅ ላይ መለጠፍ ብቻ ነው፡፡ ዛሬ ከጓዶቼ ይድነቃቸው አዲስ፣ ማዕዛ መሀመድ፣ኢ/ር ይልቃል ጌትነት፣ወይንሸት ስለሽ፣ምዕራፍ ይመርና አዲሱ ጌታነህ ጋር በቦታው ተገኝቼ ሳየው አደጋው የደረሰባቸውን የሚያወጡበት ሁኔታ ስመለከት የማሽን ሰራተኞችና የከባድ መኪና አሽከርካሪዎች መደበኛ ስራቸውን የሚያከናውኑ እንጅ የሰው አካል የሚያወጡ አይመስልም፡፡ የአደጋ ጊዜ ሰራተኞችና የእርዳታ ድርጅቶች መኖር ሲገባቸው አካባቢውን የወረረው የፖሊስ ሀይልና ደህንነት ብቻ ነው፡፡ የኢትዮጵያውያን ስቃይ መቼ እንደሚቆም፤ መንግስት አደጋ በተከሰተ ቁጥር የሀዘን ቀን ማወጁን እኛም እስከመቼ RIP እያልን እንደምንቆይ አላውቅም፡፡ ለእኔ እነዚህ ነገሮች ሁሉ የክፉ አገዛዝ ውጤቶች እንጅ መንስኤ አይደሉም፡፡ ስለሆነም መፍትሄው ኢትዮጵያን ከግፍና ከጭቆና ወደ ዴሞክራሲ ማሸጋገር እና የኢትዮጵያን ህዝብ የሀገሩ ባለቤት ማድረግ ነው፡፡ ያኔ በኢትዮጵያ ማህበራዊ ፍትህ ይሰፍናል፣የኢኮኖሚ እኩል ተጠቃሚነት ይረጋገጣል፣ነፃነት በሀገራችን ማበብ ይጀምራል፣የኢትዮጵያ ልጆችም በተሰማሩበት መስክ ሁሉ የግልና የጋራ ጥቅማቸውን ሚዛን በመጠበቅ ያለመታከት ይሰራሉ፣ያኔ ኢትዮጵውያን ከገባንበት የውርደት ማጥ ተነስተን ወደ ብልፅግና ተራራ መትመም እንጀምራለን፡፡ ከዚህ ውርደት ለመውጣት የኢትዬጵያ ህዝብ በአንድነት መቆም አለበት!! !